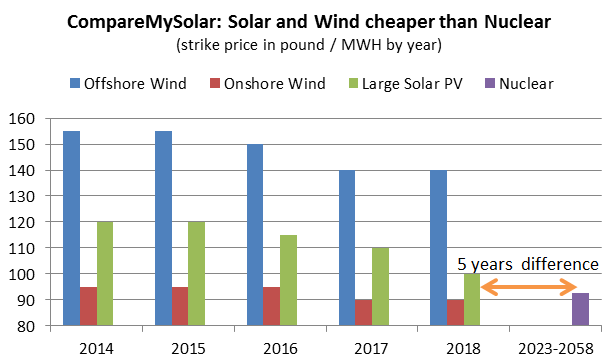 The following graph shows that the strike price for Solar PV will drop from 120 towards 100 over the 5 years till 2018, and then only needs to drop by 7.5 pounds more to beat the Hinkley Point strike price. This is totally possible, especially since the Hinkley Point nuclear strike price is fixed for 35 years! 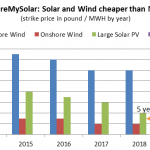 Certainly any government could see that solar and wind will be (much) cheaper than nuclear by 2023, let alone 2058. When our kids will grow up they will ask us why we ever build this new nuclear power plant.